The epigraph is taken from Heidegger’s “The Origin of the Work of Art,” and in large part the “questioning” fundamental to Heidegger’s text—that of the complex relationship between artist and art object, between world and thing— conditions Fried’s considerations of the photograph just as it did in “Art and Objecthood.” Though there is a distinctly liberating sense that Fried has, in turning his critical attention to photography, moved past the rigid dichotomies that “Art and Objecthood” “infamously” introduced (the medium itself, as we shall see, necessarily complicating those dichotomies), the essay remain central to Fried’s current argument. The question, therefore, of “why photography matters” to Fried at this stage in his career must necessarily be considered from the vantage of his earlier essay. Launching decades-worth of debate, Fried’s “Art and Objecthood” criticized minimalist art (which he often refers to as “literalist”) for being “ideological,” claiming that its project, in being “theatrical”—requiring, that is, that the art object, in order to be art at all, “include the beholder,” and that the object itself obtain a sort of “stage presence” (829)—is in direct opposition to the project of modernism and, moreover, results in nothing more than “a plea for a new genre of theatre,” which Fried reads, provocatively, as the very “negation of art” (838). The modernist project, instead, is to “defeat or suspend” the objecthood of the work of art rather than to highlight it (837). Interestingly, however, Fried posited that cinema was in fact the one art that “by its very nature (the total absorption, that is, by which its status as art object is subsumed into the work itself) escapes theatre entirely” (843). This early theorization already anticipates the unique position—at a crossroads between a cinematic absorption and the theatricality of its literal objecthood—of art photography, and it is at precisely this crossroads that Fried picks up. “It is hardly surprising,” he writes, “…that I have been deeply interested in the new photography, which I see as having reopened a range of questions and issues—a problematic of beholding—that appeared to have been closed, for all I knew permanently” (Why Photography 2). New art photography has offered Fried the ideal medium in which the debate between theatricality and absorption can, forty years later, be meaningfully resumed. The photograph, writes Barthes in Camera Lucida, “is flat, platitudinous in the true sense of the word, that is what I must acknowledge” (106). It is, indeed, the photograph’s literal “platitude” that provides Barthes, and now Fried, a surface upon which to ground their most difficult questioning. Barthes’ own consideration of the photograph came after years of resistance to the medium, and his approach—a dual concern for the photograph’s objecthood, and its resistance to that objecthood—was in no small part influenced by a very personal, emotional desire to “suspend” the objecthood of the photograph in order that he might “finally reach”—through the image of his recently deceased mother at a young age in the famous “Winter Garden photograph”—her very “being” (65-66). Speaking of the “air” of this photograph, he remarks that it was “given as an act of grace” (109); Fried picks up on this. “‘Art and Objecthood,’” he reminds us, “notoriously ends with the sentence: ‘Presentness is Grace.’ Is it possible that the essential, all but ineffable qualities that Barthes and I believed we found respectively in certain photographs and certain abstract paintings and sculptures are at bottom the same?” (Why Photograpy 1). Fried’s “volte face”—his sudden, passionate, engagement with the work of such key contemporary photographers as Jeff Wall, Thomas Demand, Rineke Dijkstra, Andreas Gursky, Thomas Struth, Cindy Sherman, Hiroshi Sugimoto, Candida Höfer, and Bernd and Hilla Becher, after allegedly putting aside a nearly-completed study of Caravaggio (Lane)—certainly recalls Barthes’ sudden, personal, approach to the photograph in Camera Lucida. And, like Camera Lucida, it is Fried’s exploration and elaboration of those “ineffable qualities” of the photograph (his own intellectual and emotional response to the work he’s examining) that constitute the book’s true strength and render its title unexpectedly apt. As with Camera Lucida, an attempt to tease from the text a single, coherent argument, would—rather than failing— be seriously beside the point. 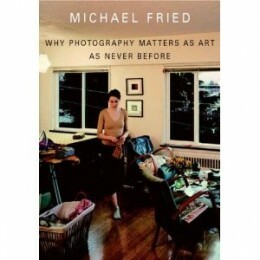 Fried’s book, instead, demonstrates that it is precisely because of the force, range and variety of our responses to photography that it matters. Where Fried falters is when he attempts to nail the “ineffable qualities” of his own responses too closely to the strict framework of his previous argument, which the ideas themselves seem to have outgrown. This is not to say, however, that the debate between absorption and theatricality has not been gainfully “reopened”; if anything, the points at which Fried’s analyses fail to convincingly cohere—where they trouble the boundary that Fried still hopes to articulate between “art” and “non-art”—only add to the value of the work as a whole. That is, rather than laying anything to rest with this book, Fried generously promises to stir further debate as well as increasingly complicated questions, which, with any luck, we will be asking for years. “I have always liked photography, and in a low-key way I was always interested in it” (Why Photography 1), Fried unassumingly begins. His introduction traces his developing interest in the medium, acknowledging the influence of friends (notably Canadian photographer Jeff Wall, whose work provides a valuable touchstone for Fried throughout the text) as well as a range of philosophical and theoretical influences. Texts by Heidegger, Wittgenstein, Hegel, Barthes, Stanley Cavell and Robert Pippin are, Fried remarks, “vital” to his project for the reason that in recent years art photography has “found itself compelled to do a certain amount of what I think of as ontological work, and because the writings of those particular philosophers have proved indispensable to my effort to make clear exactly what this has involved” (3-4). Fried demonstrates this claim convincingly in a remarkable chapter on the work of James Weller, Bernd and Hilla Becher and Jeff Wall, titled “‘Good’ Versus ‘Bad’ Objecthood.” Here, Fried explores Hegel’s distinction between “true” or “genuine” infinity and “bad” or “spurious” infinity (324), elaborating on what is at stake in the question of “objecthood,” namely: “how to specify the finitude or determinateness of (more simply) the individuality of objects in a way that does not simply contrast all the characteristics that a particular object allegedly possesses with all other possible characteristics that it does not” (324). This is Hegel’s “spurious infinite”; the true infinite, by contrast, is defined by Hegel as the “consummated return” of a thing “into self, the relation of itself to itself” (qtd in Why Photography 324). The “true” infinite, therefore, is in essence Fried’s own definition of antitheatricality. “The image of the progress to infinity is the straight line,” writes Hegel in The Encyclopedia of Logic, “…the image of the true infinity, bent back on itself, becomes the circle, the lines which has reached itself, which is closed and wholly present, without beginning and end” (qtd in Why Photography 324). This formulation not only helps to further articulate what Fried conceives of as the atemporality of anti-theatrical (“authentic”) art, but also describes the process that Fried has laid out for himself from the beginning: to remain rooted in “questioning.” In 1967 Fried had concluded “Art and Objecthood” with the reminder that, though the essay could certainly be construed as “an attack on certain artists (and critics),” what was necessary, and true to his investigation, was “the desire to distinguish between…the authentic art of our time, and other work.” Where “authentic art,” Fried argued, manifests itself in “presentness,” inauthentic art fails to do so; this presentness – he “notoriously” concludes – “is grace” (845). Forty years later, it is this same presentness that Fried perceives and explores in what would have seemed then the unlikely medium of contemporary art photography. Necessarily expanding — and sometimes inadvertently troubling — many of the restrictions imposed by his previous thinking, Why Photography Matters as Art as Never Before nevertheless returns us to the question of art itself, of the “essential all but ineffable qualities” that constitute the presentness of a work, which (in the tradition of Barthes, effectively and importantly continued by Fried) offers itself to us sometimes, as “an act of grace” (109). Barthes, Roland. Camera Lucida. Trans. Richard Howard. New York: Hill and Wang, 1980. Print. Fried, Michael. “Art and Objecthood.” Art in Theory 1900-2000: An Anthology of Changing Ideas. Eds. Charles Harrison and Paul Wood. Malden, MA: Blackwell Publishing Group, 2003. Print. Love a Human Being (Gaspereau, 2010).